Meet Gina Duffy, the fun-loving adventure junkie that decided to combine her two true passions in life – fashion and surfing – and in inspirational style truly go all out with her new lifestyle company, Sheshreds. They specialize in clothing and apparel for the fashionistas amongst the female athletes, as well as edge women and girls of all ages to take their dream on with full power and utilize their potential. Superstoked Magazine: Hello Gina! Please introduce SheShreds and tell us a bit about yourselves? Gina: Hey there, I am Gina from Sheshreds.co. We are lifestyle company that provides action/adventure apparel, gear and inspiration for fashionable female athletes. As individuals we have fifteen years experience in various positions in marketing, advertising and hospitality ranging from boutique lifestyle agencies to global shops supporting all manner of consumer product categories. Our founding partner is All-Actionsports.com, an event production and marketing entity that executes events in wake, snow and other adventure sports. It supports larger properties in programming and execution (i.e. Dew Tour, Summit Series). I myself was a key member of the international team that brought the first U.S. Moncler store to Aspen, CO. I decided to combine my two true passions- fashion and action sports, to create a cultural and retail experience for snow/wake/skate/surf/moto to all around adventure junkies like me. 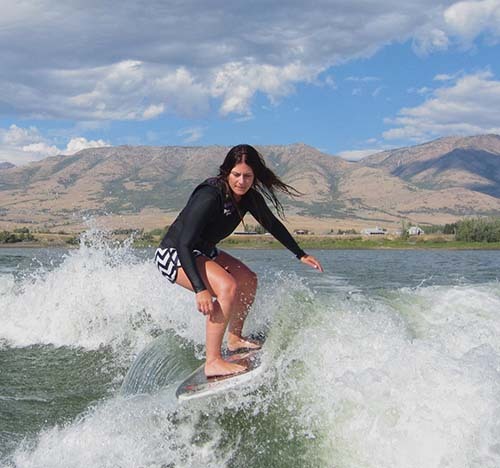 As a result, SheShreds.co was launched in 2013 to celebrate and embrace ladies of all ages that are pushing the guys out of the way and “gettin’ some” in action sports (and looking good doing it.) 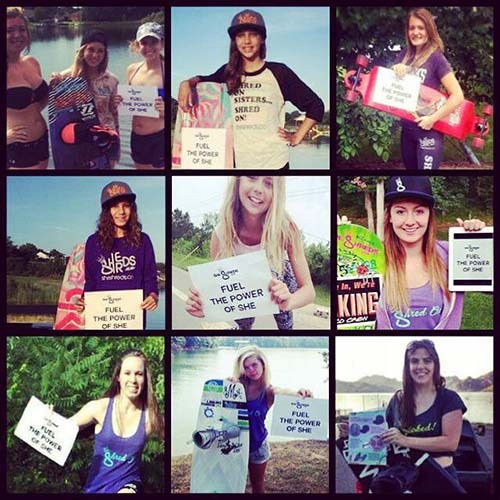 I am a key founding member of the International Women’s Wake Alliance, a new association for females in the global wakeboard industry from the pro ranks down through entry level access to the sport. Superstoked: Wow – that sounds fantastic! What inspired you to start up a clothing line for women in particular? Gina: I’ve been riding some kind of board or another since I was 14. I’m just a huge fan of these sports. I am also a fashion junkie and started reading Vogue at age 12. I’ve done talent styling on big tours for big brands, been in marketing and advertising for a long time as well. I wanted to take my two biggest passions and find a way to marry them. 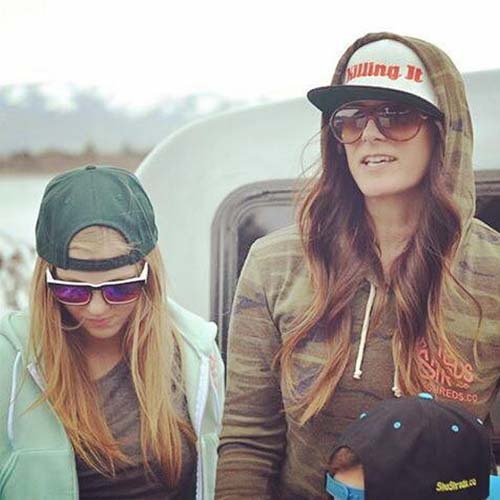 My passions inspired both our move to the mountains of Utah and the launch of sheshreds.co. Action sports/Adventure Industries are still male dominated. I want to help create a cultural shift there-The Power of SHE. I have created a brand to wear as a badge of honor and to bring females together in a unified voice to effect change in the industry for access to the sports, R and D, retail focus and respect. The number of girls and women of all ages from all over the world that have reached out to be a part of Sheshreds.co has been humbling. It is bigger than me and it has meaning and impact in its infancy. I am still driven by the original passions of mine for fashion and action sports but it is so much more as I now know there are a lot of girls and women out there counting on our support and for this to be a strong voice and brand for them and their passions. We are here to impact change for girls and women in these sports and beyond. Beauty and Beast. The Power of She! Shred on sisters, shred ON! Superstoked: That sounds inspiring. The world of womens sport has certainly taken off in the last few years, and it’s brilliant to see people like you helping promote – as you say – the Power of SHE! Have you any projects/campaigns to promote women in sport? Gina: Currently we have created the FUEL THE POWER OF SHE Indiegogo campaign to help bring SheShreds to the next level. We are very new (only 8 months old) but the momentum we have had so far has been incredible and has made us want to take it even further! We have a number of different aims and ongoing projects. * We want to continue to support our sponsored athlete program and our ambassador programs that continue to grow. * Very important to us is supporting events that have female friendly divisions and/or to become that voice at established events to garner more female access and respect. Superstoked: We would love to help – Where can our readers buy your products and support your company? 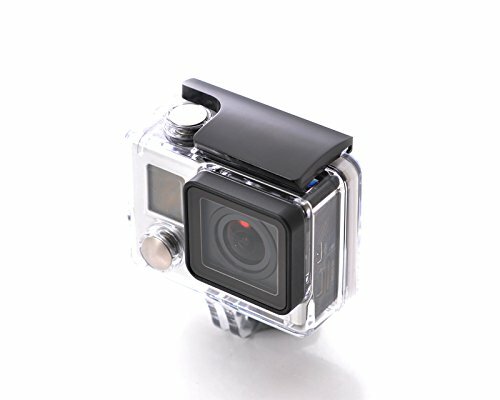 Superstoked: Perfect, we’ll be sure to let our Superstokers know. 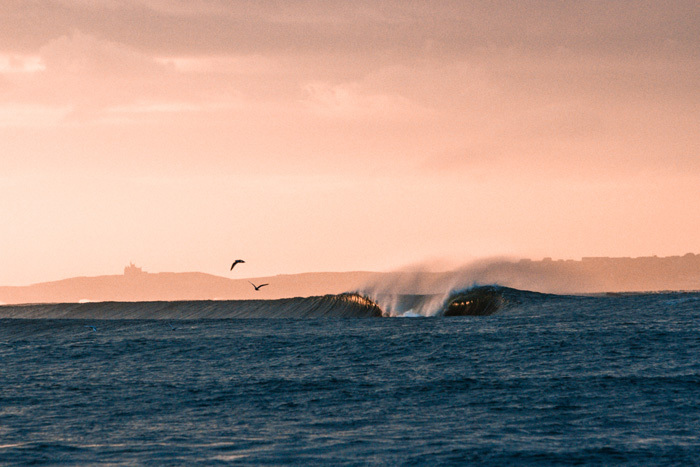 Finally, we’d love to know if you have any favorite locations to surf in the world? Gina: My favorite place to surf so far is Sayulita, Mexico! I had an amazing surf and yoga trip there and next on the list is Costa Rica. I also “surf” behind our boat which is super fun and no paddling in! Best of luck onwards with SheShreds, Gina! Shred on and stay super stoked! 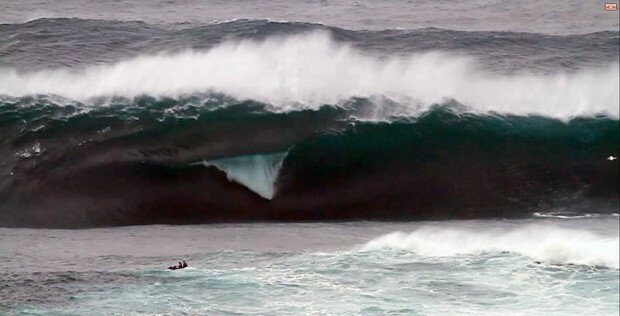 Irish surfing forum: Surf chat, surf discussion and surf advice. 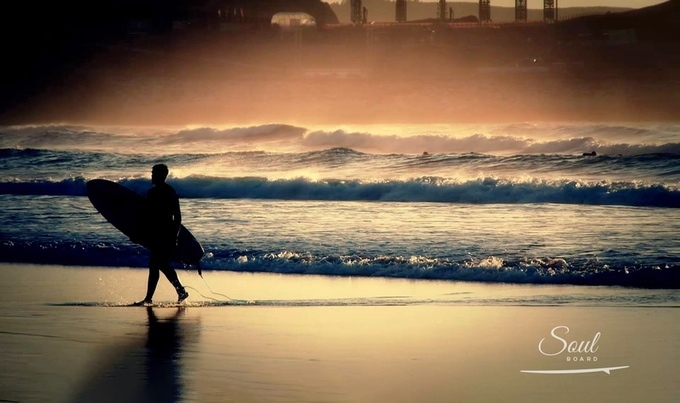 Welcome to our SURFING FORUM, a forum solely devoted to surfing and surf-related topics – such as surf travel (find the best surf holidays and get-aways! 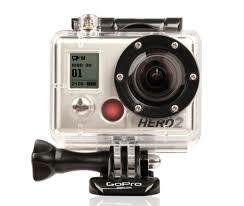 ), surf equipment (Need a ding repaired? Ask the surf experts!) and general surf talk. Our forum was recently invigorated by popular request – and the last couple of weeks we have seen a 1000% increase in visitors. We hope to see you take part in the forum, showcasing your surf services, your best surf photos (you know.. the one where you got pitted?) and videos, discuss the ASP tour with people from all over the globe – including USA, France, United Kingdom, Australia, South Africa, Norway and many more. Run a surf hostel, surf accommodation or surf camp? Why not tell our forum members about it? Share photos and videos to intrigue the readers, and who knows… one of them might visit you in the near future. All it takes is a good show and positive attitude. Want more visitors to your website? Share the link on the forum! Not only will you get direct click visitors, but you will also get what is known as a ‘backlink’ – which shortly put, strengthens your search engine ranking with popular search engines such as Google, Bing, Yahoo and many more. You know you want to…! Showcase your best photos and indulge in the awe and respect of your fellow surfers. If the videos and photos are good enough, we might post them on our website or share them with our over 6000 social media followers – ensuring you get plenty of visibility in the public domain. Pretty cool, right? Need a good laugh? Or want to meet other surfers? Start a conversation in our ‘general talk’ section and invite your friends to join in on the discussion. Sounds good? YES! Well, come on then, follow the white rabbit and register on the forum today. We want to push for a multi-national surfing forum, hence the title ‘Irish surfing forum: Surf chat, surf discussion and surf advice.’ This is to actively reach Irish surfers and encourage them to join our forum. And yes, posting in your own language is allowed, be it French, Spanish, Norwegian – we love it. 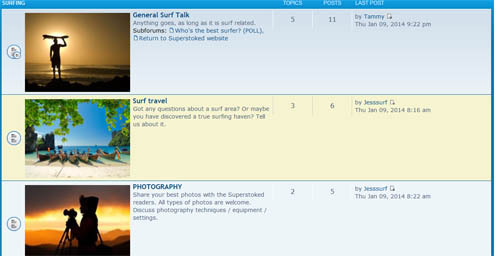 Germany – Surfing forum: Surf chat, surf discussion and surf advice. We want to push for a multi-national surfing forum, hence the title ‘Germany – Surfing forum: Surf chat, surf discussion and surf advice.’ This is to actively reach German surfers and encourage them to join our forum. And yes, posting in your own language is allowed, be it French, Spanish, Norwegian – we love it. How to paint your surfboard using airbrush, marker, paintbrush, decal or spray can. Grown tired of your Colgate white board? Or has years of neglect turned the color indistinguishable? Perhaps you just want to liven things up? What you need is a how to guide that shows you how to rekindle your board’s forlorn beauty. This guide will cover how you go about preparing the board for your art attack, what equipment to use and a basic explanation of how-to go about painting / decorating the surfboard. A clean canvas, in this instance; your surfboard – is a important piece of the puzzle if you are to have any hopes of getting your board to look decent. Wax, algae and other unrecognizable objects accumulate as layers upon layers on neglected surfboards – meaning about 90 percent of all boards (admit it). It is essential that these layers are removed before applying paint, ink or stickers to the empty canvas. – Pickle Wax Remover for Surfboards : This is sort of a two in one solution, as it provides both a way to remove the wax and the more stubborn stains (using the pickle). 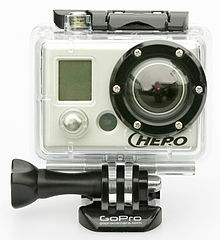 Fun product which works wonders – a must have for any surfer. Perfect prepping before ding repair as well. The Pickle Wax Remover is one of the easiest and quickest ways of removing wax from any surfboard. – Alternatively, if you don’t have a picke wax remover… Use hot water / steam to remove the heavy wax / dirt stains (there are always some stubborn ones). After you’ve scraped the worst wax of your board, you will notice that some of the stains seem to have set root deep amidst the glass fibers. Don’t keep on scraping – you’ll only damage the board. Use hot (nearly sub-boiling temperature. Disclaimer: This article takes no responsibility for damages due to hot water.) water in a casserole, dip a clean rag in the water and apply it to the stains while you gently rub it – the stain will disappear as the steam probes deep into the surfboard material; and the end result will be a (nearly) new-looking surfboard. – Now would be a good time to take care of those DINGS! To ensure you have a smooth surfboard surface, we suggest that you repair any dings or damages your board might have suffered – this is a good time to do so, as your board (if you’ve followed the guide) should be squeeky clean. Our favorite resin repair is Solarez ding repair. 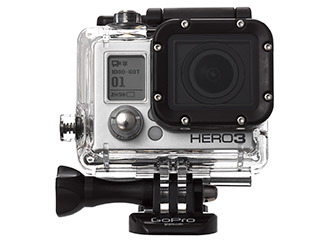 – There are many similar products, but there is a reason so many surfers stick to Solarez . Click image or here to learn more about it. 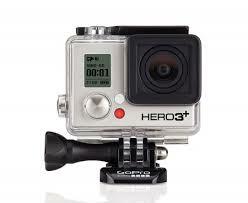 Depending on which way you choose to go about – this is essentially the equipment you’ll need. The cleaning bit has already been covered, so we’re assuming you now have a blank canvas, a sparkling clean surfboard. Next up, applying your artistic finesse. Here’s a couple of examples you might find inspiration from – courtesy of surf photographer, Trevor Murphy and Swedish surfer, Timothy Latte. Be sure to check out their Facebook pages – as they are both fun-loving guys with heaps of talent. 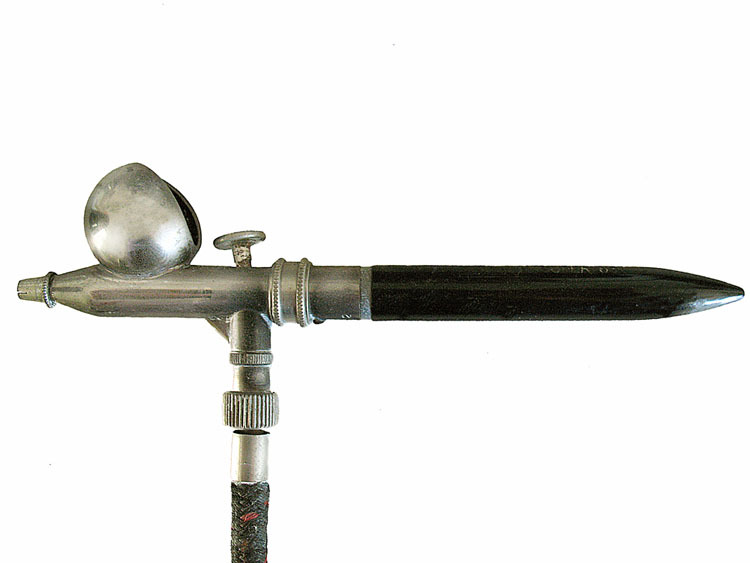 Airbrush kits used to be expensive… luckily, for the artistic ones out there, that is not the case any more. 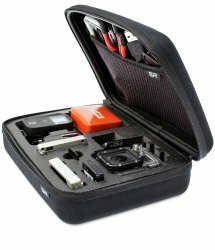 You can get a full kit (including compressor et cetera) for around 80 dollars. This is a great example of what we just said – a full airbrush kit for 80 dollars! This kit from Master Airbrush also enjoys great customer reviews, and a instruction manual training book – that will show you how to apply the paint to your board. CLICK HERE to learn more about this airbrush kit. This guide won’t go into depth about how you should apply the paint to your board, as that is controlled by your artistic mind and creativity alone – but we would recommend using the kit above. 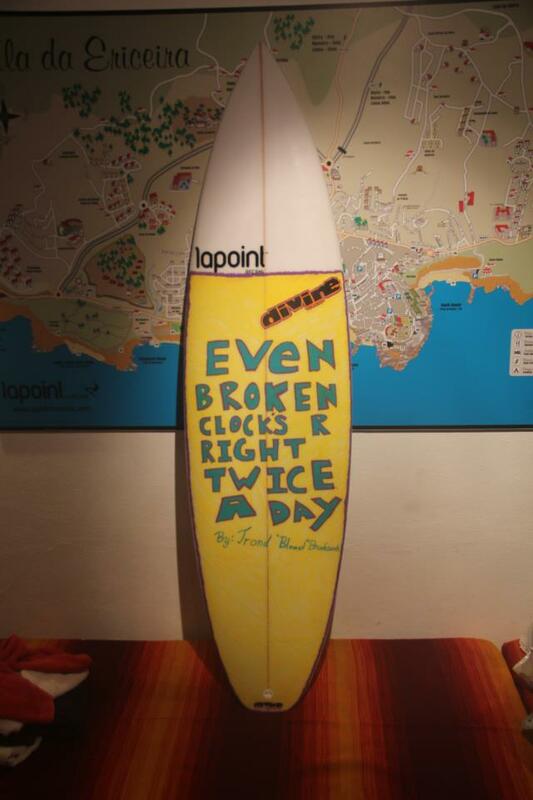 Using colorful water-based Posca pen markers to decorate your surfboard is another option. Surfers, skaters and snowboarders all use Posca pens and markers to liven up their boards – most often using colors that stand out such as fluorescent pink (see below), neon green or similar. Be sure to test the Posca marker on scrap paper before applying the paint to your board. Posca Paint Marker Pen: Bold Point. Fluorescent Pink . CLICK HERE to read more about Posca pens and see the different colors that are available. To see an example where Posca markers have been used, check out Timothy Latte’s board pictured earlier in the article. PS – Luca Sanna and Memo Gonzalez reminded us that you need to spray a top layer of protective translucent spray paint to ensure that it sticks. Thanks guys! 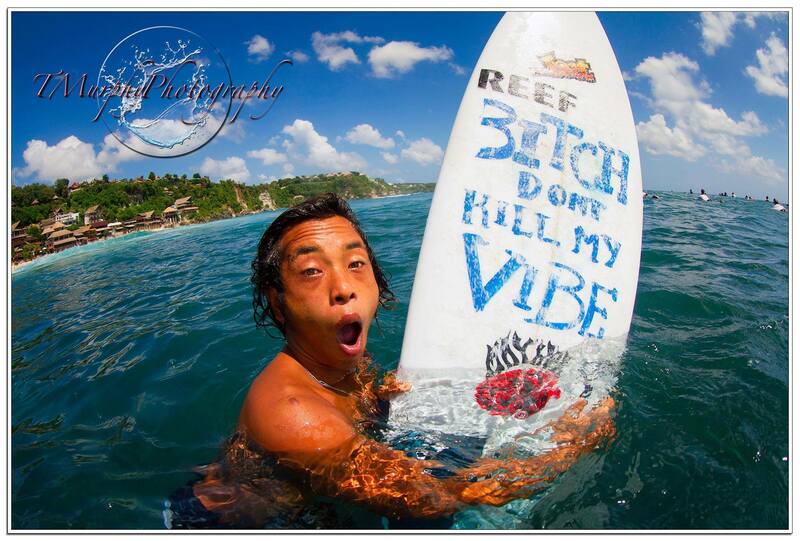 Surf Life : The text is something we all can relate to.. surf life. CLICK HERE to see the design in full resolution – and to browse other decals. Montana: Flourescent Gleaming Pink – press the image or link to read more about this color. Montana: Acid Green – press the image or link to read more about this color. Montana: Flame Blue – Another spicy color that will brighten up your surfboard. Click image or link to see more. CLICK HERE to learn more about Montana spray cans, and to see more colors. Like mentioned; Montana is the best. We speak from experience. Be sure to get a cap set with the spray cans though, as you will need to change these according to the work you are doing. This article has mentioned several different ways of painting / decorating your surfboard, and we certainly hope you’ve been inspired to go out there and freshen up your old, boring board. To summarize, airbrush is the professional’s choice, but rather expensive in comparison to Posca markers and Montana spray cans… if you want to go SAFE you can try out a couple of vinyl decals to start with. If you have any questions on this article ‘How to paint your surfboard using airbrush, marker, paintbrush, decal or spray can’, we’d love to hear from you in our FORUM or on our FACEBOOK PAGE.